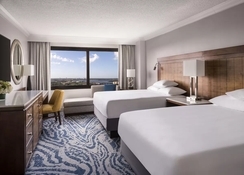 Situated right in the middle of International Drive, the Hyatt Regency Orlando is the perfect place to stay if you want to be close to the action. With Universal Studios, Walt Disney World and Sea World just a short distance away, this accommodation if great for solo travellers, couples and families. The hotel also features a spa, 2 pools with waterslides and splash pad in addition to restaurants, 2 bars, a 24 hours’ fitness centre and mini-market. There are 18 room types that sleep between 2 and 6 people including a luxurious Presidential Suite and all rooms feature free WiFi, iPod dock, air conditioning and tea and coffee making facilities. The Hyatt Regency Orlando is great both for business and pleasure and provides a comfortable starting point to your holiday in Florida. 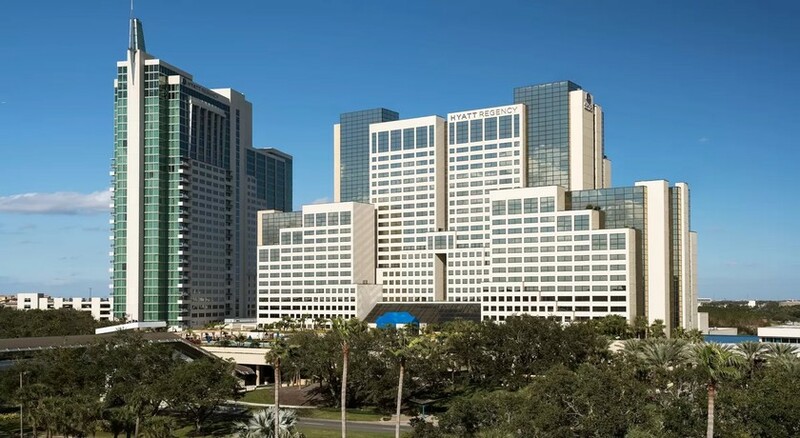 If being central to the tourist attractions is your thing then a stay at the Hyatt Regency Orlando is where you need to be. Found in the heart of International Drive, this property provides great access to Universal Studios (3 miles), SeaWorld (1.6 miles), Walt Disney World (5 miles) while Disney's Lake Buena Vista Golf Course is just under 7 miles away. The Orlando International Airport is 10 miles away and the hotel provides a shuttle service. 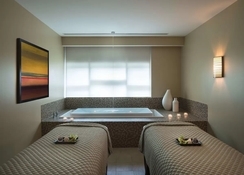 The Hyatt Regency Orlando has 1641 rooms divided up into 18 different types and can sleep up to 6 people. This includes rooms with disability access, private concierge, pool views, family rooms and the Presidential Suite has its own dining area. All rooms come with WiFi, air conditioning, fridge, flat screen TV, iPod dock and tea and coffee making facilities. Room service is also available. 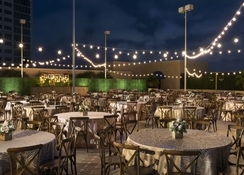 You will find a numerous restaurants and bars on-site at the Hyatt Regency Orlando. Urban Tide offers breakfast, lunch and dinner with food made from local sources, Fiorenzo has an open kitchen specialising in steaks and pasta while the B-Line Diner is open 24 hours. You can also head to Rocks and the Lobby Bar for craft beers, cocktails and a range of other alcoholic and non-alcoholic drinks and Coconuts poolside bar and grill provides snacks and drinks as you soak up the sun. Given its location on International Drive, there are an abundance of eateries and bars within walking distance as well. 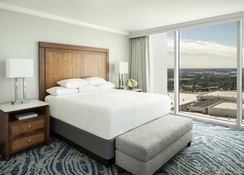 The Hyatt Regency Orlando is close to all the major theme parks including Universal Studios, Walt Disney World and SeaWorld is within close proximity too. The hotel itself has spa treatments, 2 outdoor pools as well as a fitness centre and a rooftop tennis court. 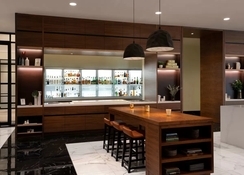 The hotel is located right on International Drive which has an abundance of things to see and do while there are opportunities for golf close by and the hotel a golf concierge service as well as bicycle rentals.